Earning income by making your own website is no longer as easy as it is before. Because now most people have been clever. Because now all browsers have the function of blocking advertising. Meaning when someone comes to our site by enabling this function Then we do not see advertisements on our blog. Due to which our income is greatly reduced.. so todays post we are discussing How To Install Adblock Killer For Opera Mini On Blogger Website . Must read this post to the last. You will learn a lot. Friends Every person in this world wants to earn online. I also want to And because of this, you people also say. Work day and night Design a website. Search engine optimization is also done. And it takes 5 to 7 months to earn from one site. After that, you get the approval the Google AdSense. And your dream is fulfilled. There is also a show on your blog. But now see, friends do not have the same income as before. The biggest reason for this is the Adblock Function. Due to which the Ads does not show. They become blocks. Together our income is also low . Uc Browser is a browser in which this function remains intact and never gets noticed when someone comes into our site. And I have already explained the way to stop it in a content. You read this. You can see this link below. 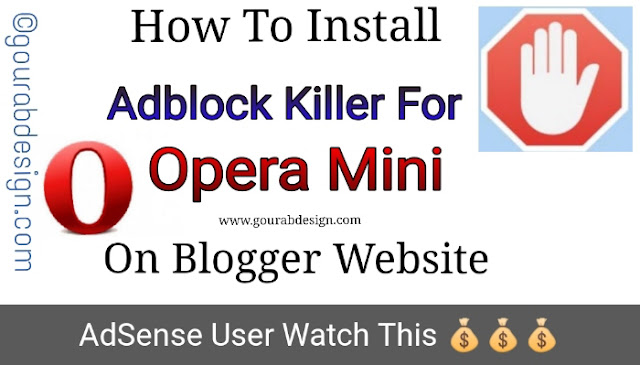 ✓ And after this script is inserted in your blog, any visitor will come into your site from Opera Mini then it will be automatically redirect in the automatic Chrome browser. Now you are wondering how this can happen. But I am telling you all it can be. When Opera Mini will be redirected to Chrome browser And all the ads will appear in your site, due to which you will be able to earn money very quickly from the website. Friends, this is a very simple way. So let us now have more information about its appearance than not talking much. Read this carefully so that you can easily understand. And just like I did the step. Ok friends. ✓ Now Click the theme > EDIT HTML . ✓ Now a box will open in front of you which coding will appear. Click on this button in the same box with the mouse and press ctrl+f . ✓ Now you see a search box will open. ✓ Now copy the full script given below👇 and add </head> tag before it. ✓ click the save theme . If there are any issues, please comment on me and ask me. I will give you reply immediately I guarantee this to everyone. And one thing that everyone wants to say is to work in blogging as soon as possible. If you do not work, you will never get money. And you'll fail in the blogging career. Do hard work like me One day they will be successful. And I always want you to become all the right people. With this hope, now I get sick all the best. . If you like our article, please share it in the social site. So that everyone can take advantage of it.